Kuilman describes four kinds of fountains: 1) the Arcadian, use of a water feature in garden design to inspire a spirit of tranquility and holiness, 2) monumental: grandiose structures that mark a place of community, as well as referencing gods and other figures of power and influence, 3) practical, many fountains served to provide drinking water for town dwellers, 4) playful, the fountain as a place to stimulate and refresh, disrupting the usual business-oriented attitude of many city dwellers. 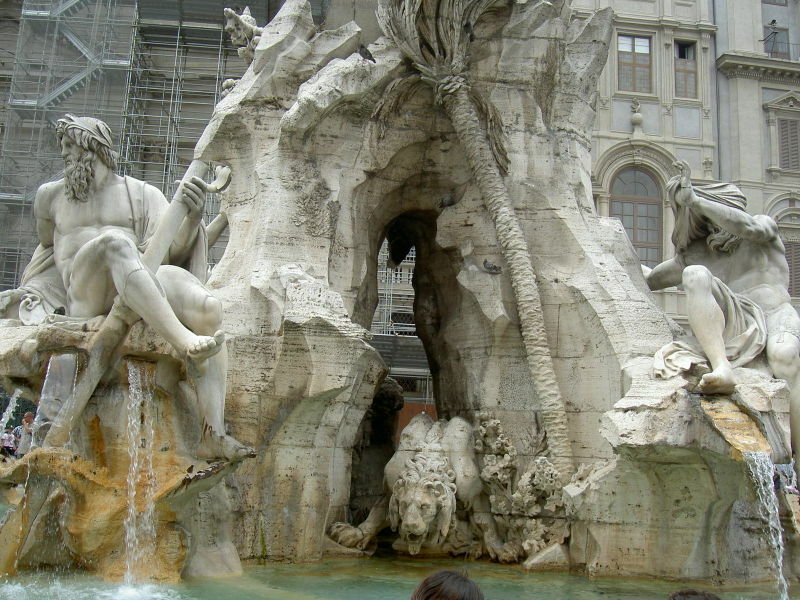 In Fellini’s film, La Dolce Vita, Sylvia played by Anita Edberg is a mesmerizing enchantress, wild for spontaneous adventure and full of unquenchable energy that the adoring and world-weary Marcello is dumbfounded by, even as she leads him into the waters of the Trevi Fountain, a moment of great romantic possibility and absurd deviance that ends in frustration and exhaustion. The playfulness of fountains could have a disruptive quality, as when in 1917 Marcel Duchamp submitted a urinal for inclusion in an art exhibition under the title, “Fountain.” Duchamp’s work was famously rejected; sparking a controversy with lingering questions about originality and context in the world of art. 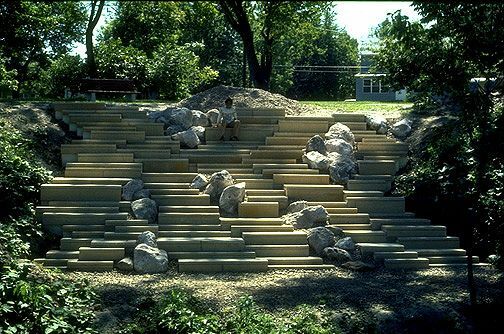 In her work Streams, 1975, contemporary Greek artist Athena Tacha, noted for her environmental sculpture, creates a delightful sense of cascading water simply by placing boulders at irregular points on a steep incline of public stairs in Oberlin, Ohio. 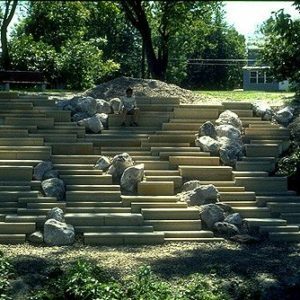 A similar set of dancing stairs, without the rocks, and arranged as an amphitheatre, was designed by Tacha for the Muhammad Ali Centre in Louisville, KY in 2008. This entry was posted in Art and tagged collage by dougcube. Bookmark the permalink.